Honeybun’s make a range of gluten free products on their farm in Dorset. You can find out more about Honeybuns from our interview with the founder Emma Goss Custard here. 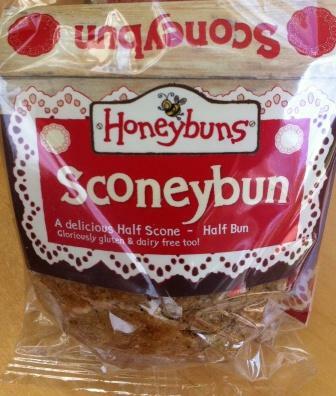 Their latest product, the Sconeybun, seems to encapsulate much of the ethos of Honeybuns. It was developed because of feedback on Facebook from their gluten free customers who indicated that they were feeling excluded from the whole cream tea experience. They wanted to produce something for sale which was more innovative and so the idea of a hybrid which would lend itself to a cream tea experience but would also be a standalone eat was borne. What they have used in the Sconeybun is also interesting. Over the years Honeybuns decided to use only ingredients that have not been altered to take the gluten out. So they don’t use wheat where the gluten has been extracted. This is good news for people, like me, who are intolerant to wheat. Instead they have looked to cuisines around the world where the ingredients used mean they are incidentally gluten free. With the Sconeybun they have used ground almonds, a staple from the very earliest days of Honeybuns, with the addition of ground flaxseed and sorghum flour, a grass used extensively in Africa. I think this product is excellent, particularly when compared with the other products available. I would be happy to serve this to anyone, gluten free or not. They have succeeded in being innovative. It is definitely not a scone, which may put off some customers. However it functions very well as a cream tea option as you can see from this photo when I had one with strawberry jam and cream. I enjoyed it. It is not a poor imitation of the normal scone. 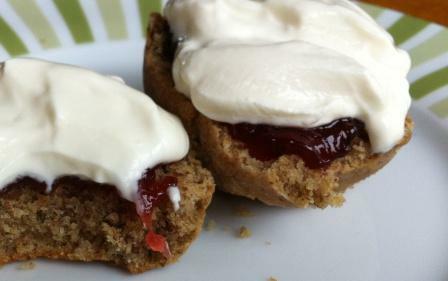 I have found many gluten free scones available commercially can be dry and a bit tasteless. By coming at the scone in a totally different way Honeybuns have provided something moist and tasty that works well with jam and cream. I even put in a bulk order and froze them so we had them when we wanted them. I also enjoyed it as a stand-alone treat. Although I did find it quite filling, it had a nice almond flavour, which is a particular favourite of mine. Look – in the packet it looks a bit small and brown but out of the packet it looks good, so for looks I would rate it 4 out of 5. Texture – moist, slightly crunchy and soft. 5 out of 5. Taste – light, almond flavour. 5 out of 5. Size wise it is spot on. Honeybun products can be found in delis and farm shops across the UK as well as being available in most Waitrose stores and John Lewis Cafes. I have found their online service to be very good and an error that occurred with one of my orders was quickly rectified in a very friendly and efficient manner.